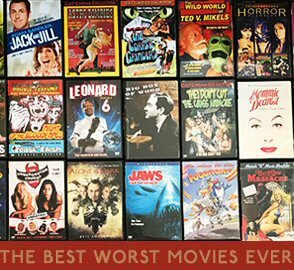 My guest today is Jeff Strand. You may know know him as my co-author of Suckers and Draculas. By coincidence, that's also how I may know him. Anyway, Jeff has been at this ebook game longer than anyone. But we really can't give him props for that, because in 11 years of ebook sales he's made exactly $73.41. That's $6.67 a year, before taxes. I'm posting this because a lot of my blog readers like hard numbers. Well, I'll let Jeff tell you. Back then, you were an “e-book author” before everything else. Stephen King had given the format a bit of legitimacy with Riding the Bullet, but 99.999% of the e-book authors were not Mr. King. I could’ve played a drinking game with the number of times I heard “Let me know when it’s a real book.” Despite my insistence that my publishers provided cover art, formatting, editing, etc. there was still a very real perception that E-Book = Self-Published = Crap. But, hey, I threw myself into e-books full force. I spent three years on the board of EPIC, an e-book authors’ organization, two of them as President, and emceed the EPPIES awards banquet (in a tux!) nine times. I continue to emcee awards banquets (in June, I’ll emcee the Bram Stoker Awards for the third time) but I will never, ever, ever, ever be on the board of a writers’ organization ever, ever, ever again. That way lies a descent into the gaping jaws of madness. In 2003, my novel Mandibles appeared in actual print, and was soon followed by a few others. It was print-on-demand and thus didn’t really appear in bookstore shelves, but the “When are you going to publish a real book?” question had been answered. I still liked e-books, but I was no longer required to be a passionate proponent of them to market my work. Sweeeeeet. Though the hardcover edition of my 2006 novel Pressure was available as a $25 trade hardcover and did get bookstore distribution, almost all of my work after that was part of the limited edition market. Unlike e-books in 2000, hardcover limited edition horror novels had a built-in market, and books like The Sinister Mr. Corpse, Disposal, The Haunted Forest Tour, and Gleefully Macabre Tales all started out exclusively available in $35-$50 editions. It was fantastic, because these books looked incredible, but in terms of reaching actual readers…well, your potential audience is not huge when you’re offering 250 copies of a $50 book. Once again, the format overshadowed the content. And then, in 2009, it finally happened. My first mass market release. The paperback edition of Pressure was in bookstores everywhere for $7.99. My sister picked one up at a military base in Korea and my dad got one in a grocery store in Alaska. There was nothing to block anybody from reading this book. It was cheap and easily available. If you wanted a copy of Pressure, by golly you could get a copy of Pressure. Dweller followed. Suddenly, it was ALL about the content. There was nothing to explain except that it was about being best buddies with a serial killer. In 2010, I looped around right back to where I’d started, with Draculas, a novel written exclusively for the e-book market. It wasn’t quite where I started, because this time I was piggybacking off JA Konrath, F. Paul Wilson, and Blake Crouch, but still, the world of publishing had changed to the point where it actually made sense to not even try to get a print contract! In 2011, I looped around again with The Sinister Mr. Corpse…except that this time, there wasn’t even the cry of “It’s not self-published! My publisher is like any other publisher except for the format! I’m a real author, dammit!” The Sinister Mr. Corpse is a self-published e-book. Eleven years later, after clawing my way up through the ranks, getting my work in a format that everybody in the world would agree was a “real” book…I decided that the best home for my zombie comedy novel was to upload it to Amazon and Smashwords myself. I can’t deny that there’s an element of frustration in watching the market change just as I broke through, but at the same time, it’s incredibly exciting. I can control the price. Upload it whenever I think it’s ready. Write whatever the hell I want. I have to admit that I’m nowhere near ready to abandon the pursuit of traditional publishing, and my next novel is going to my agent and not Amazon…but still, the freedom, and the possibilities the whole Kindle revolution offers are jaw-dropping. Unless The Sinister Mr. Corpse tanks. Then I’ll be completely bitter. Joe sez: If you want to win some Jeff Strand books, head over to All Purpose Monkey's Blog and follow the instructions. I'm proud that Jeff is finally releasing his work on Kindle, after I've been screaming at him for two years to do so. Strand, like Barry Eisler, is proof that you can lead a mentally challenged horse to water and make them drink, but it takes twenty-four months of nagging. Lately I've been accused of "shilling" reviews for my writing friends. That's complete and total absurdness. I do write a lot of 5 star reviews for friends of mine because I truly love their work, and it deserves five stars. I never write a 5 star review simply because I like someone. Especially in this case. 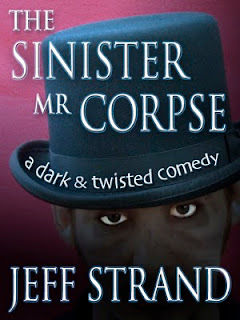 While The Sinister Mr. Corpse is a laugh aloud horrific romp and well worth the low price, I'm not giving it 5 stars because I like the author, Jeff Strand. In fact, Jeff is a jerk. A jerk, a ninny, a butthead, and a lowlife. Now, Strand may get on his high horse (as per usual) and claim that I'm calling him a poopypants because I'm envious of his writing ability. While Strand is, admittedly, an excellent writer, I'm not the type to be envious of anyone. But I do feel a need to warn everyone who may come into contact with Jeff Strand to arm yourself with some pepper spray if he gets feisty, and a portable video game if he starts talking, because hooo boy that guy can TALK. And he never says anything the slightest bit interesting. He's lucky he's gets paid for being a writer, not for giving speeches, because he's so bland he could bore monks. His delivery is slower than a snail surfing on molasses. He's so full of hot air that HE is the true cause Global Warming. Trust me. I'm an author.